Glen Canisp provides the easiest off road gateway into the heart of Assynt's hill country, including the iconic Suilven. 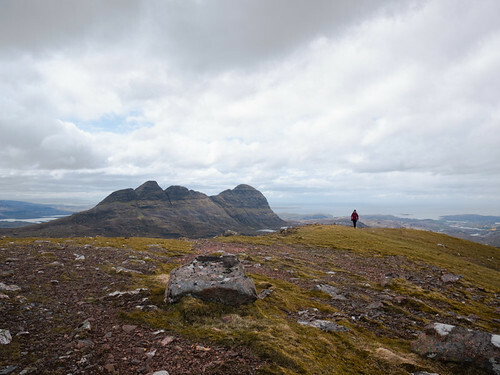 The rough and undulating landy track that runs from the Canisp Lodge to Loch na Gainimh provides for excellent running, and access to both Suilven and Canisp. While, at 846m, Canisp is a considerably higher hill than the neighbouring Suilven, it lives in the shadow of its famous little brother (as clearly demonstrated by the bad erosion on the latter). 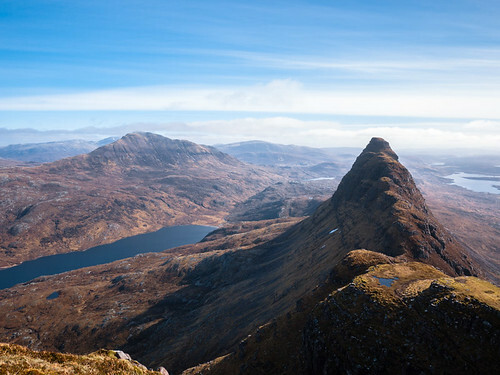 Yet, not only does it provide excellent views of Quinag, Conival, Cul Mor, Suilven, and the West coast, it also bears clear testimony to the fascinating geology of the region. And from a runners perspective, it provides for an excellent, steady, outing. Suilven competes with Stac Pollaidh for being the most iconic hill in Assynt and provides exceptionally good views all around. The run described here forms a loop, with an off track return leg over open moor. The second half is hard going, and good navigation skills are essential; a there-and-back run, is of course, possible instead. Start as for the Canisp run described above. At around NC 167 196, a small cairn on the right hand side of the track marks a place where an invariably boggy walkers footpath heads up the hill. The path takes you along the W bank of Loch a'Choire Dhuibh, crossing the outflow at NC 159 187. From this point an obvious, eroded, path heads up Suilven proper; it looks quite intimidating from below, but is, in fact, without major difficulties. Once on the Suilven ridge, head for the (amazingly round) summit of Caisteal Liath. Return back along the ridge to where the path from Glen Canisp exits onto it. At this point, another path descends the opposite (S) side of the ridge. This path is even more eroded that the N path, with lot of loose sizeable stones, and care is needed on the descent. As the ground eases off at around 300m contour line, start traversing around the SW face of Suilven, and then continue across the open moor over Cnoc na Circe, aiming to ultimately pick up the stream at NC 113 204. Follow the stream to the Cnocnaneach ruins, and from there return on a good track. 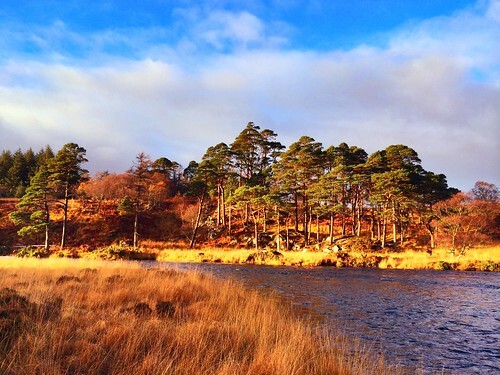 This run explores the beautiful Inver river and the moor N of Canisp glen, on a variety of running surfaces. Expect wet feet even after a spell of good weather. Start from Lochinver, taking the lovely footpath along the river. As you eventually emerge out of the woodland, the path splits at NC 116 234 -- continue along the river bank; if the water level is high, expect wet feet. Cross the river at foot bridge and then follow the access road NW onto A837. Run along the road to just beyond Little Assynt (for most of the distance, it is possible to run on the grassy shoulder) and take the footpath setting off at NC 158 250. Cross the river on a foot bridge, and as the path splits, take the right fork heading W (wet and boggy). The path improves somewhat after fording Allt an Tiaghaich at NC 151 245 (shallow, usually less than a knee deep). Stay on the path all the way to Suileag bothy. From there head the short distance S onto the main track through Glen Canisp, and return on this to Canisp lodge. As you enter Canisp lodge, take the track N (NC 117 221), rising steeply, then after a short descent, reaching a stile at NC 122 227. From beyond the stile take the path heading NW to river Inver (excellent running), closing the loop. Return to the start along the river.